That's cute! She must be all happy that u have it on your blog! Oh, that she is! She's mighty thrilled! For once, she penned her thoughts quickly and in a couple of sentences. She usually goes into micro-details when she writes and the whole exercise becomes counter-productive. This time, it was very different and the idea to write the note was also hers. Thats the cutest note written that Ihave ever seen. 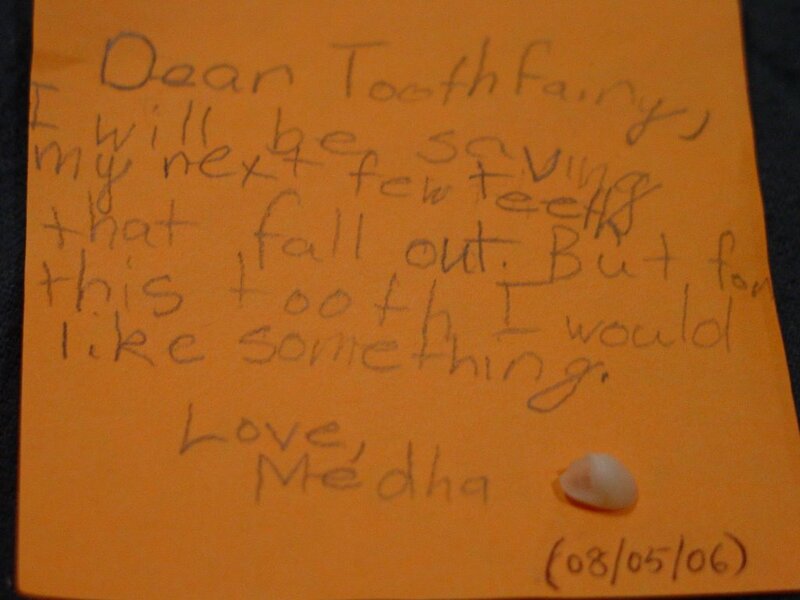 My 4 year old is already looking forward to when his teeth will fall and the tooth fairy will pay him a visit. Wow..such a cute and priceless note. I can feel your happiness thr' your blog Manisha :). God bless our cutie pie Medha. How touching, i should have done somehting of this sort, when i was a kid. My mother would have loved it!!! Indeed, precious !!! Vaishali, I think so, too! Especially as the toothfairy has been absolved of any further visits! Sumitha, you should have seen her that night! She was so thrilled that her tooth finally fell out. Well, fell is a mild word in this case! It was cajoled, it was yanked, it was pushed and pulled. And for once, she was excited about the blood on the cottonball she was holding to it. Anupama, I am sure he is! It's one of the most exciting milestones. Medha was afraid that she might end up like Arthur whose first tooth didn't fall out for the longest time. If your son likes to read or be read to, Arthur's Tooth is a great book! You might find it in your local library, too. Shilpa, thank you very much for your warm thoughts! Indianadoc, thanks! I will tell her! Archana, I am sure there are a lot of wonderful things you did as a child that your mother cherishes. And if you didn't, which is very doubtful, you sure are making up for it with every one of your cake creations!